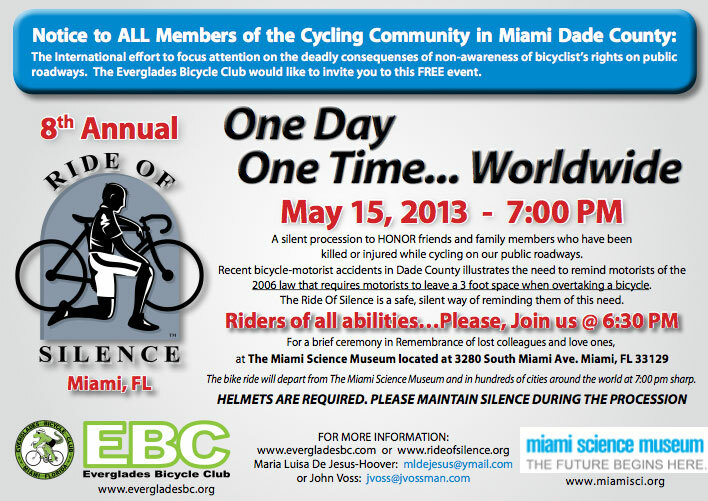 "The 8th annual Ride Of Silence Miami 2013 is scheduled for Wednesday, May 15th. It’s an international effort to focus attention on the deadly consequences of non-awareness of bicyclist’s rights on public roadways. This is the most important effort that you can make in behalf of the our community as a whole. Participants and onlookers are welcomed to bring signs with messages and wear shirts with messages for the public view and the media to report on. These are your roads and this is your ride. All are welcome so, please, put this on your calendar. The "Ride of Silence" is a silent procession to honor friends and family members who have been killed or injured while cycling on our public roadways. Recent bicycle-motorist accidents in Dade County illustrate the need to remind motorists of the 2006 law that requires motorists to leave a 3 foot space when overtaking a bicycle. The ride of silence is a safe, silent way of reminding them of this need"
Event information available on Facebook. Video from 2009 "Ride Of Silence"